Haywood Hall is located in Downtown Raleigh at 211 New Bern Place. 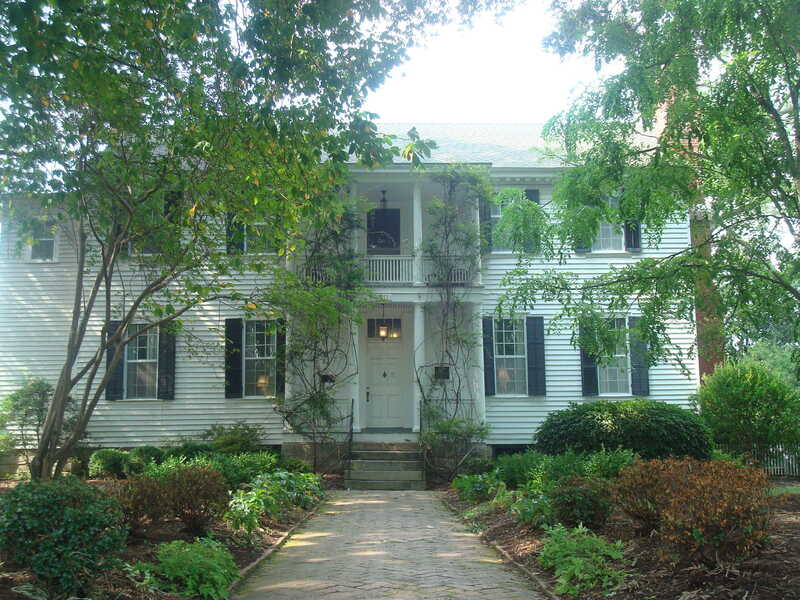 It was built in the very early 19th century and is the oldest house in the original Raleigh city limits that is still on its original foundation. 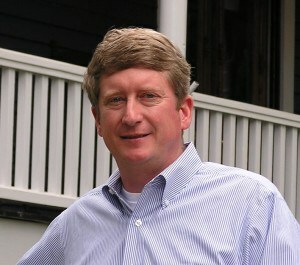 To learn more, go to haywoodhall.org. Yesterday the mercury finally hit 100 degrees. Last night it cooled down to a balmy 80. Today the temperature once again flirted with the century mark, but with even higher humidity than yesterday. The heat is dominating the news and dominating conversations. “Hot enough for you?” “Stay cool!” It’s all heat, all the time. But you know what? It’s August in North Carolina. It’s supposed to be hot. Days like these are why we have high ceilings, big rocking-chair front porches, and iced tea. Days like these also give us license to enjoy life at a slower pace. Now, don’t get me wrong. We don’t want our weather this hot all the time. If that’s what we wanted, we’d live in, oh, Arizona maybe. But a few days here and there or even a solid week of relentless 100-degree heat in a North Carolina summer are a fair trade-off for the ease of a North Carolina winter. So kick off your shoes, slow down, and grab a cold drink. So today I pulled up most of my tomato plants. Well, I pulled all of them up except for the cherry tomatoes, even though it’s still the middle of summer here and my plants still looked great. My stress levels should drop now that I no longer have to worry about my tomato plants. I planted an even dozen tomato plants in this year’s expanded backyard garden. For all of my efforts, we were rewarded with a grand total of two tomatoes on our plates from the garden this summer. Even those two tomatoes were not hole-free, thanks to the birds. I have waged a backyard battle all summer long against the squirrels and the birds. I tried many things. When I put nets over the plants, the creatures went under the nets or just pecked and munched in spite of the nets. I hung aluminum pie plates in the garden, but that didn’t frighten anything away. I put up a plastic owl, but once again nothing was frightened away. I tried leaving the half-eaten tomatoes hanging on the vine so that the creatures could return to those and leave the others alone. All these efforts were in vain. 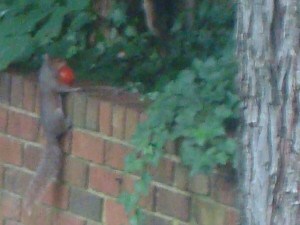 The squirrels in my yard have become quite talented at running with tomatoes in their mouths. They can climb trees while a tomato half their weight hangs from their jaws. Oftentimes, however, they are quite content to devour their loot at our picnic table! They seem to love tomatoes at any stage of ripeness. Green, red, it’s all good to the squirrels and the birds. I can’t forget the birds! They’re relentless in their pursuit of my tomatoes, too. Who knew that even robins prefer tomatoes to what they usually find on the ground? So now we’ll have to be content with cherry tomatoes–(why don’t they like the little ones?!?!)–habanero! peppers, and some eggplant. 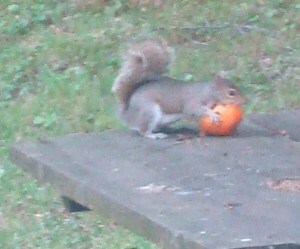 Squirrel carrying away one of my tomatoes. Squirrel feasting on one of my tomatoes. Who Am I? And Why Am I Writing This Blog?